I bet you thought you were done reading about septic-related topics, didn’t you?! According to my watch, I still get today and tomorrow, so hold on to your horses! Consider this, your septic system is one of the MOST expensive parts of your home. Did you know when building a new home, a typical septic system can run between $8,000 – 12,000? That’s a HUGE chunk of change!! And yet, again, it’s the part no one wants to think about. Flooring, window dressings, kitchen appliances, and floor plans are MUCH more exciting and fun to think about. I feel the same way. Planning and maintaining your septic system…not so much. And….then it ruins all the fun pretty things you just put in your new home…. So, though it may not be the FUN part of building or maintaining your home, it is a necessary part and one you should be mindful of. Otherwise, stuff you REALLY DON’T WANT (i.e. smelly, dirty, poopy water and its…ahem…”debris”) will be back in your home OR pooling in your yard for your dog or child to play in. Being the girl who takes all sorts of crazy calls, I have heard it all. I feel so bad for someone who is having issues with their system. I am an insanely OCD person about my home and yard. I would never want what sometimes happens to people happening to me. The good news? You can eliminate this!! Most septic systems (if cared for properly) should last around 20-30 years and be relatively problem free!! It just takes a little mindfulness on your part. I like to use the analogy of car maintenance with septic maintenance. First of all, just like you change the oil in your car every 3,000-5,000 miles, your septic tank should be pumped every 3-5 years. As I mentioned before, we base this on your home’s activity level — the more people, the faster matter builds up in the bottom of your tank. If it’s just you and your spouse, waiting every 5 years to pump is perfectly fine. If you have a family of 4, then every 3 years. The more people who use your home, the more often it needs to be pumped. Again, using the car analogy, if you want your car to last a long time, you do things to care for it, like not driving it too fast, crashing it into things, and just being careful every time you use it. The same is true for your septic system. You have to be mindful of your water usage, what you put down the drain, and how you treat the drainfield area outside. 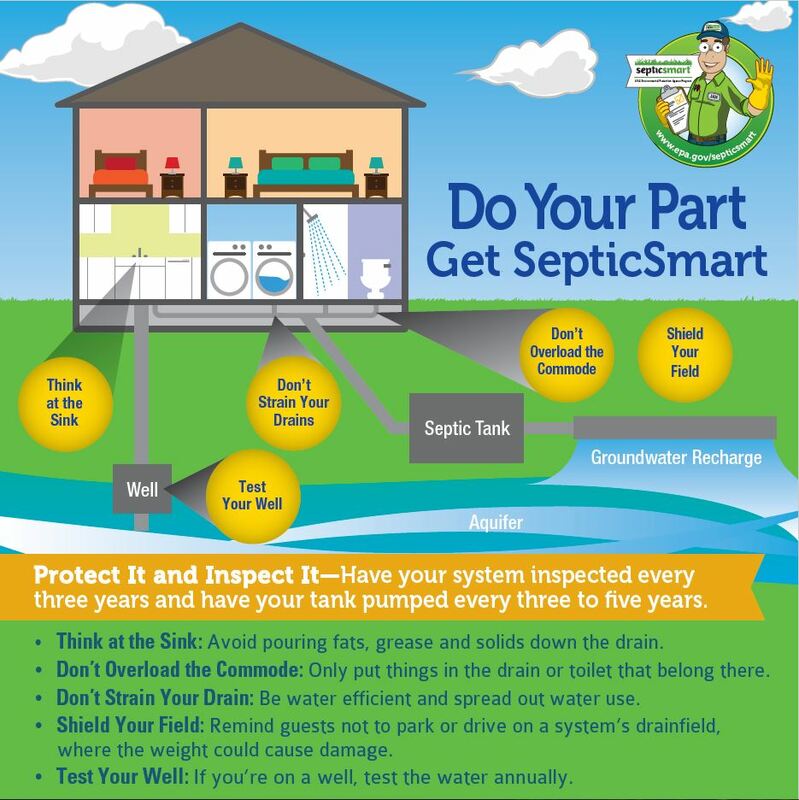 Keep in mind that though living on a septic system isn’t rocket science, it is also different than living in town. You don’t want to put too much water out to your system at any one time. Your tank (when functioning properly) is always full of water. So if you have all the family over for Christmas be careful that the dishwasher, washing machine, and all three showers aren’t running at the same time. That’s like putting 20 gallons of water in a 5 gallon bucket. It’s too much water all at once for the system to take on. Also, chemicals used in your house need to be used with care. It’s not that you can’t clean and use your drain, but excessive use of chemicals (whether it be industrial cleaners, painting products, oil from the garage, etc) need to find another place for disposal. Not the kitchen sink or floor drain in your garage (if that floor drain leads to your system). Finally, be mindful of possible water leaks in the house. A toilet that sticks can really cause a mess on a septic system. Water softners that re-charge excessively or even a whole house humidifier that goes on the blitz can put excess water to your system. Water usage is HUGE when living on septic, so just be careful how much you use. As for your drainfield outside? This area needs to be kept free from trees and bushes. Only grasses or vegetation with little root systems should grow over it. Also, nothing heavier than a lawnmower should ever be driven in this area. Trucks or tractors can crush your lateral underneath and cause pooling of that not-so-pleasant water draining from your house, so please keep heavy stuff off this area too. Finally, making sure the drainfield doesn’t get water from other areas like storm-water runoff or sprinklers. In order for your system to work properly, it needs to stay dry. Your lateral field is like a sponge absorbing all the water that comes from your house. But if it is already wet from sprinklers or runoff water, it will have a harder time keeping up with what you send to it from your house. Last but not least, be mindful that just as your car runs a little bit less efficient with age, so does your septic system. Nothing lasts forever (unfortunately), so as your system ages, be kinder to it just like you would Grandpa’s 65 Ford Mustang. Time and tenderness are key! Hopefully this article has been informative despite it’s length. Thanks for hanging in there with me until the end. You’re a trooper. Only one more day must you bear with my wastewater talk! Until then!